Multiple one bedroom sea view apartments forming part of a holiday complex in Qawra, enjoying direct sea views. Close to all amenities in the area including, numerous restaurants, bars, beach lidos and the National Aquarium. Ideal for all age groups. Multiple two bedroom apartments forming part of a seaside holiday complex in Qawra. Apartments ideal for up to 5 persons enjoying direct sea views. Close to all amenities in the area including, restaurants, bars, the Cafe del Mar beach lido and a Casino. Qawra one bedroom holiday apartments located a few minutes walk away from bars, restaurants and the nightlife and promenade of Bugibba. 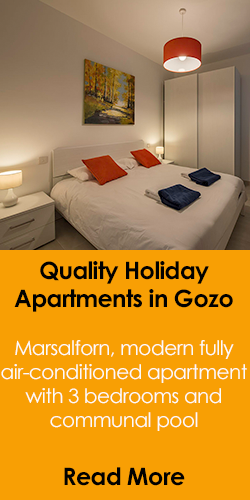 Each holiday apartment enjoys air conditioning, fans, satellite TV, FREE WiFi and a rooftop swimming pool. Excellent price ! Excellent sea from location - One bedroom apartment located on the promenade of Qawra/St Paul's bay. A few minutes walk away from the national aquarium and one of the best beach lidos of the area. The national aquarium and a casino are also within walking distance. Two bedroom Sea View Holiday apartment located on the promenade of Qawra/St Paul's bay. 7 minutes walk away from the national aquarium and one of the best beach lidos of the areas. The national aquarium and the Oracle casino are also within walking distance. Holiday accommodation for 6 persons in this lovely two bedroom apartment located on the Qawra Seafront promenade. Apartment facilities include a flat screen TV with 90 free channels, free Wi-Fi, air conditioning and more. The sea side is just below the apartment block. Location, location, location ! 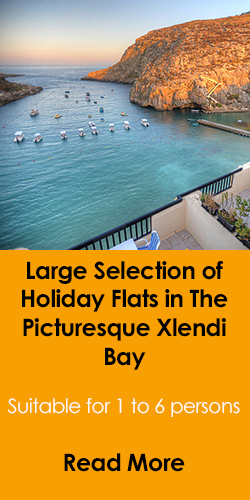 A sea front holiday apartment providing accommodation for up to 3 persons. The apartment is fully equipped including AC, TV with Netflix & 90 channels, free Wi-Fi and more. ATM's, shops, restaurants, lidos are all within walking distance. A 2 bedroom holiday apartment accommodating up to 6 guests intenting to visit Malta for their holidays and wishing to be in a seafront location. The apartment is fully equipped including AC, a flat screen TV with 90 free channels, free Wi-Fi and more. One bedroom apartment located on the seafront of the popular sea side village of Qawra, a suburb of St Paul's Bay and within walking disctance to numerous restaurants, cafes, a casino, the Cafe Del Mar beach club and the Malta National Aquarium. Excellent location. Located on the seafront promenade of Qawra/St Paul's Bay, this lovely one bedroom apartment is just a few minutes walk away from the national aquarium, the Cafe Del Mar Beach club, the Oracle Casino and a good selection of bars and restaurants. Qawra holiday Apartment malta with direct sea views. Excellent location in a new block of apartments enjoying a balcony, set in a tranquil area yet a few minutes away from cafes, restaurants, bus stop. WIFI & TV available. A fully furnished, just refurbished, three bedroom semi detached apartment located in a very sought after area of Qawra just 5 minutes walk from the sea and the promenade and enjoying country views. One bedroom apartment with sea-view, balcony facing the open sea, close to restaurants, cafes and the center of this lovely seaside town within no more than a 3 to 5 minute walk. WiFi , TV. sleeps 1 to 4 persons. 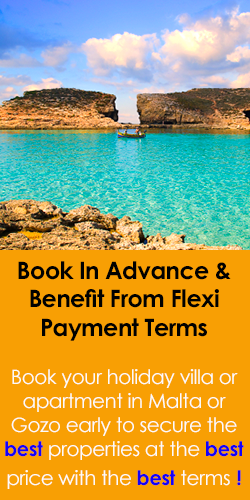 Book your holiday now to secure availability. Ground floor 3 bedroom holiday apartment in Qawra. With an independent entrance, an outdoor area, free WiFi, Air Conditioners and a garage. Located in a quiet area within walking distance to restaurants, beach and centre. A bus stop is just a couple of minutes away. Direct sea view apartment with balcony in Qawra St Paul's Bay Malta. In a fantastic location, just a few minutes walk to a bust stop, cafes, restaurants and swimming pool lidos. Air conditioning available. One bedroom self catering apartments located in Qawra with a sleeping capacity of up to 3 persons. Excellent Location right on the seafront and good value for money. Qawra seaside 2 bedroom apartments, located just a stone throw away from the sea front, promenade and all ameneties in this popular seaside village. 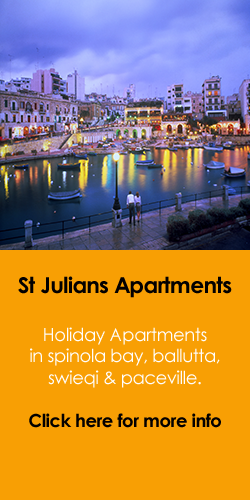 These holiday apartments also have access to a swimming pool, jacuzzi and gym. Multiple studio apartments in Qawra located a few minutes walk away from a variety of bars and restaurants and from the Bugibba promenade. Air conditioning, ceiling fan, satellite TV, FREE WiFi, safe & a rooftop swimming pool. You won't find any cheaper than this !! One Bedroom low cost apartment to rent in in the popular sea side town of Qawra, Malta. 1 minute walk to Qawra seafront promenade. 1 bedroom with up to 6 single beds, one bathroom and a medium sized living/dining/kitchen area. Two Bedroom apartment for short stays, to rent in the front of Qawra St Pauls Bay enjoying a partial side seaview. 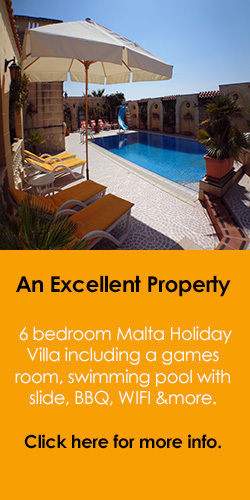 Suitable for 4 persons spending their holidays in Malta. A spacious holiday rental penthouse/apartment in Qawra, a suburb of St Pauls Bay with two large terraces both enjoting seaviews. 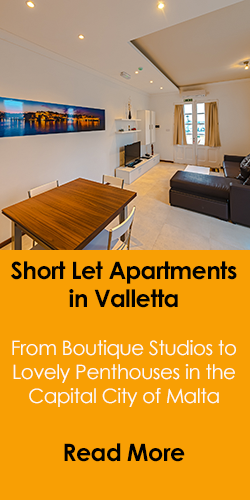 Situated in a central location of this populare Maltese seaside town. Highly Recommended. Large ground floor one bedroom apartment in Qawra Malta, one minute walk to the seaside promenade, bus stop, restaurants, the national aquarium and the cafe del mar beach club. Qawra, Malta apartments for rent. Well furnished and spacious holiday property in this popular seaside village. Close to the recently opened national aquarium and cafe del mar beach club. A lovely 2 bedroom penthouse in Bugbibba limits of Qawra with fantastic sea views from the terrace. The property sleeps 6 persons, 2 bedrooms, 2 bathrooms, air-conditioning, large dining area and a lovely terrace. Free WIFI is offered to all guests. Excellent Value. A lovely self catering apartment ideal for summer or winter tranquility. Situated in a quiet & peaceful area of Qawra, a suburb of the picturesque St Paul's Bay, only a few minutes walk from the beach. Offering spacious, bright & airy accommodation for up to 6 persons.